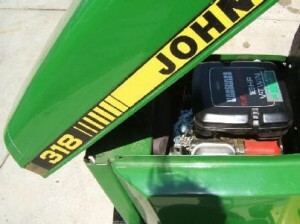 Q: Do you have a bolt in replacement kit for a John Deere 318? I have a bad Onan engine and would like a price for a kit. What comes in the installation kit? Is the wiring harness the same? Engine mounts? Clutch? I am looking for a relatively easy in and out. Do you provide phone support? A: I have the top of the line Vanguard engines. They are the only way to go. Yes, we offer telephone support and a lot of it. You can call as many times as you need to on my toll free number to get your installation completed. There is a list of the items in the installation kit on our web site on the engine page. You do not take out your original wiring harness. There are no engine mounts that you have to mess with. All you do on that part of the subject is to drill 4 holes in the frame to mount the engine. Yes, you use your same PTO clutch as we have a special machined bushing so you can save buying that $300 PTO clutch. You will think this job is fairly easy to do providing you are a little mechanically inclined. We have sold quite a few of these repower kits for John Deere 318′s over the years and I don’t think anyone who intended on doing the installation themselves couldn’t complete the job.